Tough, portable comfort that is great for snoozing at night or kicking off your boots for a spell during a day hike. 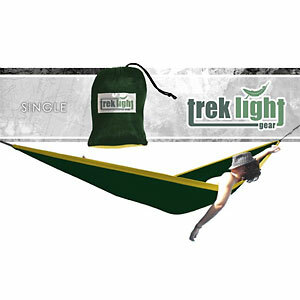 There are many reasons for hikers and backpackers to embrace hammock camping: the use of tree hugger straps for suspension allows hammockers to follow Leave No Trace ethics (although officially LNT has no recommendation for or against hammock camping); the flexibility of setup allows one to camp in areas where rocky, damp, or uneven terrain might make tent camping impossible; hammock and tarp options can shave grams off one's base weight, and more. But I love them because they are fun! Get in a hammock and feel the world float away. Stretch in one in the sun and waken to find yourself refreshed from an untroubled dream. Stretch one between two trees and discover the leaves have turned into dollar bills . . . oh, wait! That was just the dream. But they are fun. One recent day I went for a day hike along some lakeshore watershed trails. I was hiking along a ridge I'd not explored before, and the trail suddenly curved directly toward the lake, up the hill. Where the trail veered back to my left to follow the shoreline, I went straight, just over the crest of the ridge and a few steps down the precipitous slope that fell away to the water below. It was here that I pulled out my Trek Light Gear Double (hereafter TLG Double) and relaxed for an unhurried rest. An envious hiker walked past; a seagull cried out over the lake. This was heaven! Trek Light Gear was founded by Seth Haber and a friend; it is a company with a refreshing philosophy (reducing stress and more), and I have been impressed by their customer service. 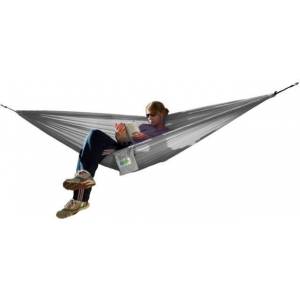 Seth and friends have also created a good supply of information for prospective hammockers on the TLG web site, a useful resource for those sorting through various options and techniques. 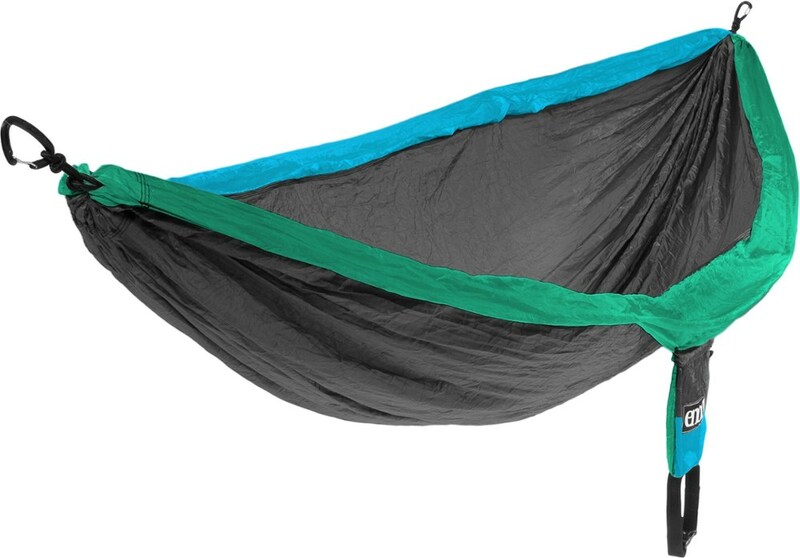 The TLG Double hammock is made of anti-mildew, anti-rot parachute nylon. Seams are triple-stitched for durability and strength. Fit and finish are top notch. 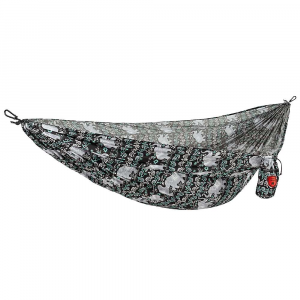 A convenient design feature is the integrated storage pouch that--when the hammock is in use--serves as a pocket for glasses, keys, etc., or which holds the hammock when it is not in use. I own both the TLG Single and the TLG Double; what I notice with the Double is that--unlike the TLG Single's--this storage pouch gets quite full and it is a bit of a struggle to squeeze in my whoopee slings, tree hugger straps, and carabiners for suspension. A modest enlargement of this pouch would make this no problem. The TLG Double comes in any of 20 color combinations, including camp for those who wish to stealth camp or who wish to protect their rest by escaping undisturbed from prying eyes. Mine is the khaki and green model, purchased when TLG had a killer sale before the holidays (look for those if you're interested). I like the parachute cloth; it creates an interesting shimmer for the eye, feels luxurious to the touch, and dries quickly. Weighing 20 ounces (567g), the TLG Double fits easily into pack, a compressible wad of material that adapts well to nooks and crannies. The suspension elements that the TLG Double comes with include two short pieces of static cord attached to two S-hooks. 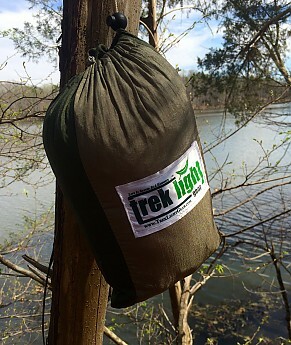 These I promptly replaced with whoopee slings and tree hugger straps (not TLG products--I made my own; see image above) to shave weight and add versatility, but TLG does offer a separate rope and carabiner bundle kit for those who wish to go that route. Measuring 6x10 feet, the TLG Double allows one generous space to stretch out, more than six feet on the diagonal, which is the preferred mode of resting or sleeping among hammock devotees. 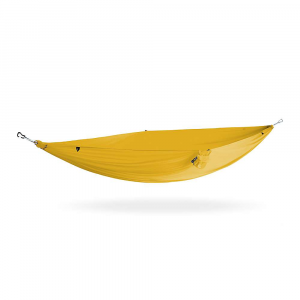 When prone on the diagonal, one is close to being flat--the banana effect of lying in the hammock in line with the suspension points is negated. 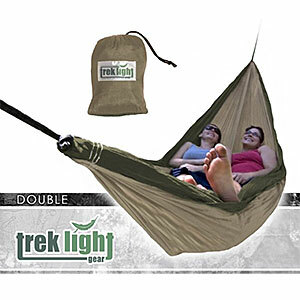 Add a sleep pad inside the hammock or an underquilt below, and pull a sleeping bag or top quilt over your body, and the TLG Double will permit you to get a great night's sleep. It took me awhile to get my angles just right, but then--wow! I was out cold and awaking from deep REM sleep, refreshed and amazed by the comfort of my hammock. 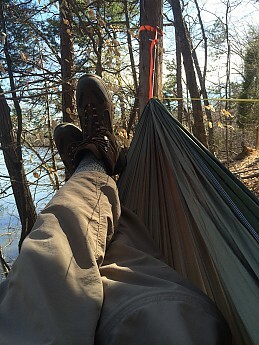 I consider myself a relative novice in hammock camping, but the bug has bitten me, and I don't see going back to tents of my own volition. 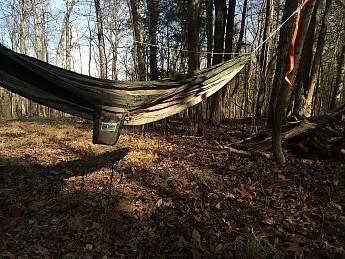 The TLG Double is my constant companion on more ambitious day hikes when getting off my feet for a while is a welcome break; within a minute or two I can be reclining in comfort, swinging in the breeze. 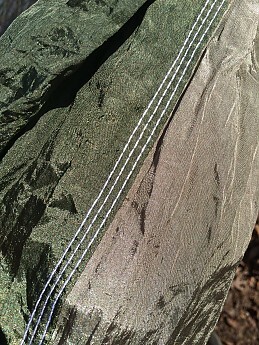 It is also the basis for my hammock camping system (I added the bug net TLG offers to stave off skeeters and the like). So far, so much fun! I like to start hiking early, and then throw up my hammock mid-day for a short snooze! Brilliant idea! I love my morning coffee in the hammock, sitting perpendicular to the suspension. In all seriousness, it looks like a good setup and I like the fact you did the DIY approach with the straps and made it more adjustable and lighter weight. Great review. Nicely done. Never heard of strapworks until now. Thanks for the rec. This hammock is awesome. it is so comfortable, even with me and my girlfriend in it. Way better night's sleep than in a tent on the ground. Very lightweight. It's a hammock and it's awesome. It's big, its super comfortable, two people can sleep in it. It is very well constructed. Packs super small and is very light. It's about 20 oz. dries quickly when wet. Super stable and you really can't fall out.